In a sense, it is a test of navigational skills for the three students on our boat responsible for getting it back to Sidney. 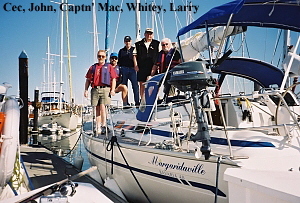 A week ago, Cec, John and Whitey were complete novices at sailing and coastal cruising. 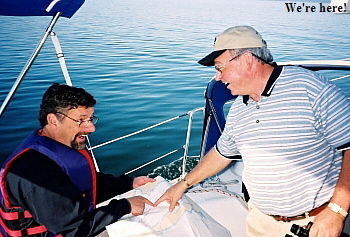 However, they did have some theoretical knowledge, having recently completed the Canadian Power and Sail Squadrons (CPS) Boating Course in Edmonton, Alberta. Now, they’ve spent a week on the water with me, their course instructor, putting theory into practice. We had started the week with a fourth student, Larry, who does not finish the cruise (I’ll explain later). We spend our week visiting these ports of call while practicing seamanship and navigational skills. Each day, two students are “navigators” and two are “helmsmen.” Navigators check the weather, prepare tide and current graphs, plot courses and keep track of our position. Helmsmen check the engine, stow loose gear, steer the courses provided and anchor or moor as required. Sunshine and a light breeze on our first day provide perfect conditions for practicing man-over-board drills and various points of sail. Students are impressed with how quickly the boat turns around and stops with a back-winded jib. A bit more practice and they’ll be able to stop so we can reach the man overboard! We arrive in Bedwell Harbour at South Pender Island with time to practice close-quarters maneuvering – turning the boat using “prop walk” in reverse and short bursts in forward against a turned rudder. We then tie to one of many mooring balls at Beaumont Marine Park. We awake the next morning to fog horns and a white curtain surrounding the harbour. In the fall, coastal fog usually dissipates before noon. While waiting, we enjoy a leisurely breakfast followed by a dinghy ride to the marina. Bedwell Harbour is in the final stages of some major re-development with townhouses overlooking a new marina and spanking new facilities for visiting boaters, including the use of a hot tub and swimming pool for those staying at the marina. We stroll around looking at yachts and discussing how rough a sailor’s life can be. 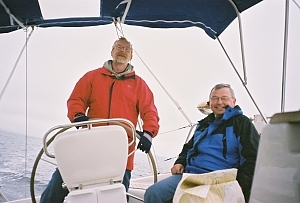 Later, we motor to Ellen Bay at Prevost Island for lunch; then sail to Montague Harbour at Galiano Island, practicing reefing and heaving-to along the way. 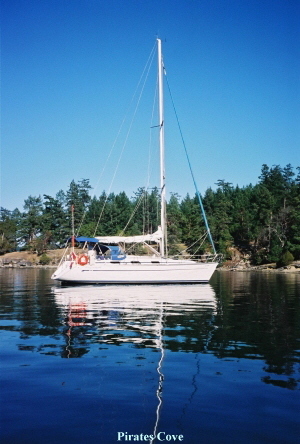 The next day, we anchor in the very charming Princess Bay at Wallace Island. This narrow notch requires tying a stern line to one of the brightly painted rings imbedded in the rocky shore. A scenic walk takes us to nearby Conover Cove, another tranquil anchorage in this marine park. After lunch, we motor to the quaint village of Chemainus on Vancouver Island and take a self-guided tour of its award-winning historical murals painted on the walls of buildings. After buying some groceries and topping up our water, we cross the channel to Telegraph Harbour at Thetis Island for our evening anchorage. While waiting for fog to burn off the next morning, each student practices docking at the marina. Our destination that evening is Silva Bay at Gabriola Island. A lunch stop in popular Pirates Cove at De Courcy Island will allow us to transit Gabriola Passage close to slack water at 1600. We meander through this picturesque marine park which has a treasure chest next to the park sign. Feeling a bit like swashbuckling pirates, we open the chest and read the instructions: “leave an item, take an item.” I suggest we leave a bottle of rum in exchange for a Report-a-Poacher key chain. Cec pipes up: “Aarrrgh matie, any more stupid suggestions like that and there’ll be mutiny on the Margaridaville!” I get the feeling we’re developing nicely as a team! In Pirates Cove we learn a painful lesson about hatches. Preparing to get underway, Larry neglects to secure the anchor hatch with the attached bungey cord as previously demonstrated. The wake from a passing boat causes a rocking motion. KABOOM! … down comes the hatch on his fingers causing deep cuts and severe bleeding. After bandaging his wounds, we proceed to Silva Bay, our northernmost destination in the Gulf Islands. A call to the marina manager leads to the transport of Larry by ferry and taxi to Nanaimo Hospital on Vancouver Island where he can receive proper medical attention. Larry decides not to continue with the cruise, agreeing to meet us back in Sidney. The ever-present morning fog is not burning off as we depart Silva Bay on our way south to Porlier Pass. A half-mile of visibility allows us to keep Valdes Island in sight as we confirm our dead reckoning (DR) positions along the way. We transition the Pass during slack water and continue motoring to beautiful Maple Bay where we anchor for lunch in Bird’s Eye Cove. We’re definitely getting good at two cruising skills: anchoring and lunching! In the afternoon we motor through S-shaped Sansum Narrows to our destination of Genoa Bay. Although the Grapevine Café at the marina came highly recommended, they had already closed for the off-season. Apparently, the chef is well known for his original ostrich burgers. Our chef, Whitey, is well known for his original sausage burgers, which he alternately serves with spaghetti, eggs and pancakes. Obviously, we purchased way too many sausages during our shopping spree in Sidney. Our final day dawns with, you guessed it … fog. Departing Genoa Bay, we plot a course 1.5 miles southwest to the village of Cowichan for diesel fuel. At four knots, we should arrive in about 22 minutes. After 10 minutes, we are just able to make out the marina. Another 12 minutes and we’re there — perfect! After refueling, I suggest to the guys that they are now responsible for getting us back to Sidney. I would only assist or advise if we were in “harms way.” We agree on a lunch stop at Portland Island, a marine park donated to the province by Princess Margaret in 1961. Visibility is sufficient to maintain visual contact with shore and various markers along our course. I note a distinct increase in finger pointing as John and Whitey monitor our progress. We anchor in Royal Cove. Although there are reportedly good trails throughout this densely wooded island, the guys are keen to get the sails up. So after a quick lunch of barbecued sausages, we motor east along the edge of Portland Island. I notice that we’re heading close to an area of water teaming with gulls and cormorants. I remark that such a gathering of feeding birds often indicates a shoal area. Sure enough, the chart shows Turnbull Reef extending 1/2 mile off shore. 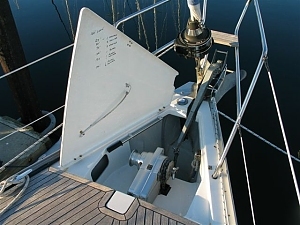 I further remark that most groundings of cruising boats occur by helmsmen taking shortcuts while the captain is down below. Since the captain is NOT down below, shortcuts are not an option! Following my subtle suggestion, Cec steers away from the reef into safe water close to Canoe Rock — excellent! Our course is intended to take us directly south past Coal Island in 35 minutes and Dock Island 10 minutes later at our estimated speed of 5 kts. Up go the sails. A headwind requires a close reach southwest toward Coal Island, which appears faintly in the distance. A departing ferry from nearby Swartz Bay requires a tack to the east. Shortly after, a tugboat pulling a barge requires a gybe to the northwest. Within minutes, we lose visual contact with all land and markers. Down come the sails. We are now inside our gray cocoon, alone and perplexed. So, where are we and what do we do?